I’ve been an advocate for a robust bicycle sharing system since I first used BIXI system in Montreal. BIXI was how I got around the city core during my four day visit. Recently, Minneapolis hosted a delegation of Austinites and they introduced us to their Nice Bike system. Yours truly ended up in a photo. It’s my belief that a bike share system should be an integral part of the transit discussion. For distances of less than 1 mile, these are cost-effective systems of getting urban-Austinites and visitors where they want to get to. A large bike sharing network is also superb recreational amenity. Yesterday, I was excited to visit City Hall to checkout the B-Cycle shared bicycle program demo. This system is currently in place in Denver, though it has fewer stations than the Nice Bike or BIXI system in Minneapolis and Montreal, respectively. All of these systems use a three-geared bike that’s easy to use. 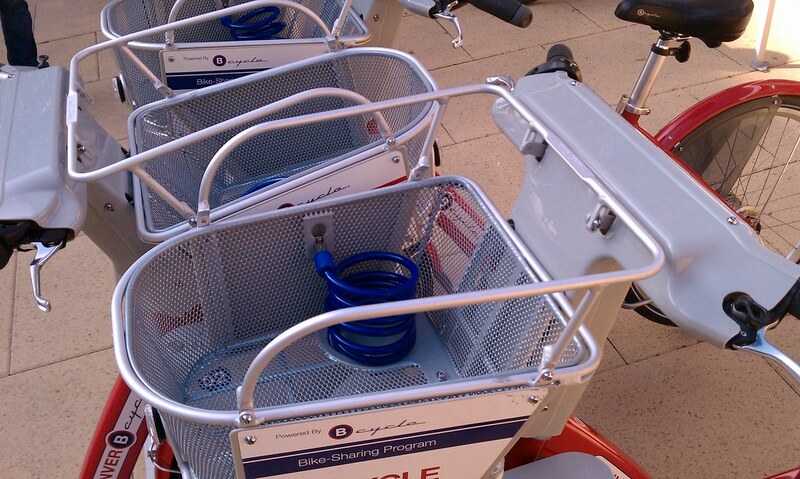 The bikes include a basket and a lock. The ergonomics encourage a leisurely and comfortable ride. From the B-Cycle FAQ, we learn that fees to use the system can be specified by the city or promoter, but usually include an annual, monthly, weekly, daily and single use fees. In Denver, a 24 hour membership cost $5. This doesn’t mean you rent the bike for 24 hours. Rather, for 24 hours, you can quickly pickup/drop off bikes at any station. The first 30 minutes are free, subsequent 30 minutes have escalating fees. Bike sharing systems like B-Cycle market themselves as being scalable, and therefor easy to buy into. However, the utility of these systems grows along with the number of stations. A modest investment in too few stations, or poorly located stations, could result in under-adoption and quickly be the death of the system. For a city that likes to be outside and champions a progressive pace of life, the future is bright for bike sharing in Austin. Last night we snapped some pics of the construction of the mezzanine level of AMLI on 2nd’s retail space along 2nd Street. According to AMLI the deal with Violet Crown is still solid and we can expect an arthouse movie theater in the near future. It appears from the rendering that the entrance will be the staircase and elevator next to BoConcept. Do UT Students Use/Care About MetroRail? Six months after the opening of the MetroRail… Downtown Austin Blog contributor, Nicole Sanseverino, hops on board the Red Line with an update on just how well the $110 million dollar project is doing. “The MetroRail… I don’t know anyone who takes it,” said one UT student. According to Cap Metro, less than one percent of the UT community take advantage of the rail. One student who lives in Round Rock says the rail is a convenient way to get to class. “It’s quick, it’s calm, sometimes I can sleep on it. I don’t get sick like on the bus,” said UT student Anke Sanders. But, she does wish the rail operated at other times during the day. “If it could ran more often especially during weekends maybe to go downtown for dinner or something that’d be ideal,” Sanders said. If the City’s proposed Mobility Bond passes in November, it will launch an effort to expand the rail. CapMetro approved mid-day service beginning in January, but doesn’t have any concrete plans to increase the actual infrastructure of the rail. “We don’t have any immediate plans for building more. I think what people would see first would be maybe purchasing more vehicles, expanding these rail stations,” Cap Metro spokesperson Misty Whited said. After its first six months, the MetroRail is averaging 800 riders per day, but the city of Austin and CapMetro hope that as the population increases, so will ridership. Despite some bumpy tracks near its beginning, the rail chugs along. This Wednesday from 11-2pm, drop by city hall to see B-Cycle bike sharing concept in action. Last month, we wrote that bike sharing could not only help solve many “last mile” transit problems, it would also become a superb recreational amenity for the entire city and its visitors. Tour downtown Austin’s condo and apartment buildings this Sunday with the Downtown Austin Neighborhood Association, as part of their annual Downtown Living Tour (aka “DLT). Buildings on the tour include: W Hotel Residences, 5 Fifty Five, 904 West, Austin City Lofts, Brazos Lofts, Gables Park Plaza, Brown Building, Brazos Place, 360 Condos, Red River Flats, Gables West Avenue, Spring Condos. Click here to reserve your ticket. Tickets are $15 ($25 day of).